Updated Sunday November 13, 2016 by FCLL. 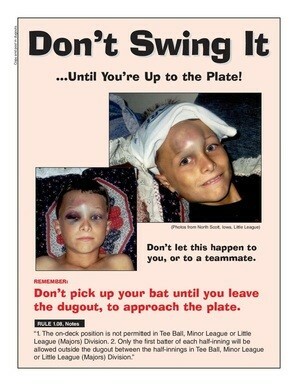 The most important aspect of Little League Baseball is SAFETY. For T-Ball, Rookies, Minors and Majors there is no "On Deck" circle and we ask that NO ONE pick up a bat until it is his or her turn to bat. We want all our players to go home and enjoy the rest of the day when they are done their games/practices. Please remember Safety, Safety, Safety. NOTE 1: Junior/Senior/Big League: The 2¾ inch in diameter bat is not allowed in any division.